In 1995, the careers of Keiji Mutoh and Ric Flair were going in different directions. Mutoh was in his prime in 1995, having already won the IWGP Heavyweight Championship twice and he was the current reigning champion when the G1 Climax began. The 46 year old Flair, on the other hand, was still a respected wrestler but appeared to be in the twilight of his career as Hulk Hogan had recently joined WCW and Flair was pushed back to a secondary role. He was still a contender for the WCW Heavyweight Championship, however, and Mutoh was not foolish enough to look past one of the greatest wrestlers in history. This was not the first time that Mutoh and Flair had crossed paths. 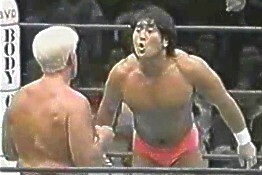 They had last met in a singles match in December of 1989, when Mutoh was wrestling as Great Muta in WCW. Flair would get the better of Mutoh on that night, being the first person to defeat Muta in a singles match during his run in WCW. Back then, of course, Flair was the star of WCW and Great Muta was the invading young wrestler, so the result wasn't a surprise. Fast forward to 1995, however, as now Mutoh was the star in his home promotion and Flair was the invading wrestler trying to prove that he hadn't lost a step since their last meeting 6 years prior. The G1 Climax in 1995 wasn't the large affair that it had been in past years, as only 8 wrestlers participated. The smaller number meant no easy wins, however, and both blocks were loaded with high class wrestlers. Flair and Mutoh would find themselves in the same bracket, along with Masahiro Chono and Shiro Koshinaka. Going into the last night before the Semi Final, Ric Flair was in the lead with 3 points, followed by Mutoh and Koshinaka with 2 points, and Masahiro Chono with 1 point. If Flair and Mutoh reached a conclusion by pinfall or submission, that wrestler would have at least 4 points and would be guaranteed a spot in the Semi Final. Mutoh and Flair went first, so it was unknown at the time what the exact end result of the match would be the next night. All everyone knew was that both wrestlers needed a win to lock their place in the Semi Final. Mutoh seemed to be at a disadvantage before the match even started, as due to getting busted open in a previous match he had a large bandage on his forehead. Since Flair is the dirtiest player in the game, everyone (including Mutoh) was aware that he would take full advantage of Mutoh's prior injury. Another advantage for Flair was that since he had 3 points, all he needed was a draw to guarantee a trip to the Semi Final, while Mutoh had to win by pinfall or submission to be sure a spot in the next round. The stage is set. They circle each other to start, tie-up, Flair pushes Mutoh into the corner but he gives a clean break. They circle each other again, this time Mutoh pushes Flair into the corner but he gives a clean break as well. They go into a Test of Strength, Mutoh pushes Flair to his knees before pushing him back into the corner. He gives Flair a clean break again but this time gives Flair a WOOOOOOO as he backs up. Flair goes out to the apron to re-group but returns after a moment, tie-up, side headlock takedown by Flair and he twists on Mutoh's arm. Wristlock by Flair into a hammerlock back into an armbar, and Flair pushes Mutoh back to the mat. Mutoh struggles back up but Flair continues twisting on his arm. Flair drops Mutoh back to the mat and puts his knee into Mutoh's arm while pulling back on it, he pulls Mutoh back up and applies an arm wringer. Mutoh pushes Flair into the ropes to get the submission broken, but Flair elbows Mutoh in the head before twisting his arm in the ropes. Mutoh escapes and rolls out of the ring, but he quickly returns. Arm wringer by Flair but Mutoh hits a side headlock takedown. Flair rolls to the ropes to break up the hold and both men return to their feet again. Tie-up, Irish whip by Flair and Mutoh shoulderblocks him down. Dropkick by Mutoh and he hits a second one, sending Flair out of the ring. Mutoh goes up to the top turnbuckle but gets back down, deciding not to risk diving down onto Flair. Flair returns to the ring, Irish whip by Flair, shoulderblock by Mutoh, Mutoh picks up Flair, side headlock takedown and he keeps the hold applied on the mat. Flair gets back up and pushes Mutoh into the ropes, forcing a break. Chops by Flair in the corner and he punches Mutoh right in his bandaged head. Flair rams Mutoh into the turnbuckle and punches him in the forehead a few more times. More punches by Flair in the corner and he stomps on Mutoh's leg. Snapmare by Flair, cover, but it gets a two count. Flair applies a headscissors to Mutoh, but Mutoh rolls to the ropes to force a break. Mutoh returns to his feet, chops by Flair in the corner but Mutoh fights back. They trade chops, with Mutoh getting the better of it as Flair falls to the mat. He returns to his feet, knees by Flair, Irish whip to the corner, reversed, and Mutoh delivers a back bodydrop. Mutoh kicks Flair in the corner, Irish whip, and Flair flips over the top turnbuckle down to the floor. Flair gets back on the apron but Mutoh punches him and suplexes him back into the ring. Dropkick by Mutoh, he goes up to the top turnbuckle but Flair moves out of the way of the missile dropkick. Flair quickly slaps on the figure four leg lock, but after a minute Mutoh makes it to the ropes to force a break. Flair goes off the ropes and kicks Mutoh in the knee before kicking him in the knee again. Flair waits for Mutoh to get up and gives him another kick, he then drops a knee onto Mutoh's injured leg. Flair picks up Mutoh, but Mutoh fights back and the two trade blows. Flair gets the better of it by kicking Mutoh in the knee, he then goes up to the top turnbuckle but Mutoh has recovered and joins him. Superplex by Mutoh, Irish whip from the corner and he delivers the cartwheel elbow strike followed by the face crusher. Backbreaker by Mutoh, he goes up to the top turnbuckle but Flair rolls out of the way of the moonsault and Mutoh lands on his injured knee. 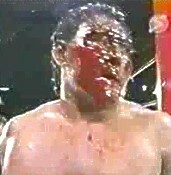 To make matters worse for Mutoh, his bandage has opened and blood has begun flowing down his face. And in this way, Keiji Mutoh reached the Semi Final of the G1 Climax. He fought through the pain in his leg and the blood in his eyes to defeat one of the greatest legends in wrestling history in the middle of the ring. Mutoh would go on to defeat Scott Norton in the Semi Final and Shinya Hashimoto in the Finals to win his first (and only) New Japan G1 Climax. His victory would cement 1995 as one of the best in Mutoh's career, as he held the IWGP Heavyweight Championship for the majority of the year and defeated his main rival Shinya Hashimoto to accomplish both achievements. Even though Ric Flair was defeated, he showed that he wasn't done yet and when he returned to WCW he showed them as well as he would win the WCW Heavyweight Championship again in December over Randy Savage. He would actually go on to win the title two more times after that, proving that even after wrestling for 25 years that he still had a lot left in the tank. But on this night, Mutoh was the better man. 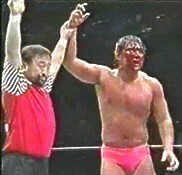 Flair wore down Mutoh's arm, leg, and blooded him but Mutoh wouldn't stay down and knew that his destiny was to win the G1 Climax for the first time. This would be Mutoh and Flair's last match together, and they made sure it was one that all those in attendance wouldn't forget.